I’m just back from a fabulous weekend in Cornwall for a wedding, and didn’t manage to post this while I was there due to a) the wedding, b) alcohol, and c) all the fun. Before heading down on Friday, I squeezed in a quick 4 mile circuit of Crouch End on Thursday night. Running was just one of a long list of tasks to tick off that evening. If the ideal run is ‘free’, unbounded by time or distance pressures, then this was the opposite of that. My mind was racing over packing and remembering the bridal make-up and borrowing the video camera and buying confetti and would we get a seat on the train and what time we should leave and before my brain had started to unwind the run was over. To make amends, and to balance all the merrymaking, we planned a 5 mile run in Cornwall on the Saturday morning from our borrowed house in Stithians. It was a glowering morning, the few splashes of sunshine chased away by swift clouds, wind bobbing the hedgerow flowers. The roads were narrow and winding and a car swerved wildly around one bend to avoid us. The greens and blues I had been expecting from the Cornish countryside were strangely leached of brightness and I couldn’t seem to fix the route map in my head firmly enough not to worry constantly about becoming lost. 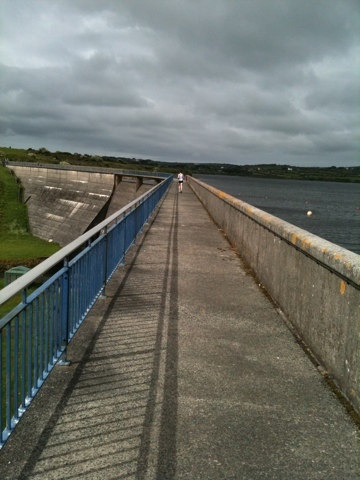 That’s me, crossing the concrete dam of the reservoir, which had turned what was probably once a charming valley into a giant grey water trough. It was a bleak sight, even in the shaft of sunlight that greeted us as we approached the shore. It might be unfair to stretch this observation into something wider, but it seemed to me, as I quaffed champagne on a deck overlooking Helford Passage later that day, that the crumbling working parts of Cornwall were bringing the manicured parts into uncomfortable relief. A drive past boarded up buildings in Redruth on the way to drink cappucinos in St Ives this morning increased my unease. As runs go, this wasn’t free in terms of route or timing, but I can picture every corner and hill. I was free to think about the land, the houses and who might live there, the weather and the passing cars. We weren’t running fast so I wasn’t thinking about my body at all, not even my hangover. I think it was mainly an exercise for my brain.